Artist's concept of nuclear reactor-powered Jupiter Icy Moons Orbiter. Tough technological work is ahead if project is to become reality. NASA's Prometheus program to employ nuclear reactors in space is a work in progress - viewed as a key building block of the space agency's vision for space exploration. Shortly after the programmatic liftoff of Prometheus, NASA had its eyes on the Jupiter Icy Moon Mission (JIMO). This premier outing pushed by electric-propulsion engines would study three ice-covered Galilean moons -- Ganymede, Callisto and Europa - with JIMO relaying oodles of data about the moons' origin, evolution, and to scope out any potential for faraway life. But JIMO has now been deferred. With a launch date of 2015 and a mission design life of 20 years, the flagship mission was lowered to half mast. Prometheus officials are now looking at other targets to showcase a space nuclear power system. Less demanding in terms of overall lifetime, this Prometheus mission would happen sooner and likely journey to a closer-in target. Still ahead, however, are daunting technical and safety challenges. Keeping the financial tap on full throttle to harness space nuclear power will also be taxing - an investment reality for Congress and the public. The NASA Exploration Initiative is a multi-mission, multi-decade, human and robotic effort to explore the Moon, Mars and beyond using a spiral development process to introduce important new technologies as they mature. In this regard, space nuclear fission reactor systems could reset the way the reconnaissance of our solar system has been done over the decades. Prometheus planet hopping is part of this "new age of exploration" that's being promised. The Prometheus Project is managed by NASA's Jet Propulsion Laboratory (JPL). But a visit to JPL's web site on the work mirrors the still-to-be-determined nature of the high-profile endeavor. What's the mission and science for Prometheus? "Information coming soon", the web site advises. That's another way of saying that harnessing nuclear power for space voyaging has long been an elusive task. "If one stood on top of a pile of all the studies of space nuclear power that have been performed over the past 20 years, one would be several feet closer to Mars...at least during some hours of the day," explained Steven Aftergood, head of the Project on Government Secrecy for the Federation of American Scientists in Washington, D.C.
Aftergood noted in a recent newsletter that, as a technology enterprise, space nuclear reactors have been "subject to a remarkable cycle of boom and bust over the past 50 years." Start-stop work has dead-ended ambitious programs every decade or so, Aftergood said, noting the SP-100 program - a NASA, Department of Defense, Department of Energy initiative -- that was killed ten years ago after some $400 million had been doled out. Move up to today: "Proponents note that space reactors hold the promise of dramatic enhancements in the scope, lifetime and effectiveness of space exploration activities," Aftergood said. Under an agreement signed last August, the reactor for Prometheus is being developed for NASA by the U.S. Department of Energy's Office of Naval Reactors in Washington, D.C. They are no newcomers to nuclear power plants. But not for space missions. Naval Reactors provides nuclear propulsion plants for the Navy's fleet of aircraft carriers, as well as attack and strategic submarines. The Naval Reactors organization brings to the table an unabashed track record spanning 50-plus years of expertise in developing powerful, safe, rugged, reliable, compact and long-lived reactor systems for use in unforgiving environments. Naval Reactors declares that over 130 million miles have been safely steamed on nuclear power. They currently operate over 100 reactors and have accrued more than 5,500 reactor-years of operations. Because of their demonstrated reliability, the organization salutes the fact that U.S. nuclear-powered warships are welcomed in more than 150 ports of call in over 50 foreign countries and dependencies. The dual-agency Prometheus partnership also involves Knolls Atomic Power Laboratory in Schenectady, New York, as well as Bettis Laboratory in Pittsburgh, Pennsylvania, and other supporting Department of Energy national laboratories. "There's a lot of enthusiasm. They have staffed up vigorously," said John Casani, Prometheus project manager at JPL. Sailing Earth's ocean or plying through the ocean of space under nuclear power - there's a difference, Casani explained. For one, the space reactor has to be smaller and more compact than on submarines. "Running a reactor...you reject heat to the ocean and that's an infinite heat sink. Space, you've got to reject heat through radiators. And the radiation environment is not from the reactor so much, but the radiation of space itself," Casani told SPACE.com in an interview during February's Space Technology & Applications International Forum (STAIF), held in Albuquerque, New Mexico. So simply bolting in a sub's nuclear power plant into a spacecraft isn't in the cards. Naval Reactors didn't sign up for space reactor work without forethought about putting at risk their record of success. Getting hooked up with another agency, security issues, and over commitment of their work force also had to be taken into account. "Yes, they do things differently than we do," Casani added. "But they are driven by the same imperative for success, safety, and doing it right. I think we've integrated very well with them." 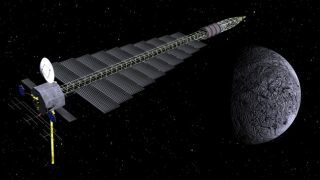 The Prometheus space reactor system would provide more electrical power than available for past missions. That added energy can greatly enhance the capability of electric propulsion, the number and variety of scientific instruments on the spacecraft, the rate of data transmission, and orbital maneuvering. Last September, JPL selected Northrop Grumman Space Technology of Redondo Beach, California as the contractor for co-designing the proposed Prometheus spacecraft. The contract award is for approximately $400 million, covering work through mid-2008. "Prometheus is the project name, not the destination," said Peggy Nelson, Northrop Grumman vice president and project manager for Prometheus 1. "Prometheus is a template spacecraft that will explore a number of different locations," she told SPACE.com in a phone interview. Nelson's group is working on aspects of JIMO, as well as alterative first missions. Those new missions would be shorter in duration, on the order of three to five years, she said. There's a big difference in short-duration Prometheus hardware, Nelson advised, contrasted to JIMO's life expectancy of 20 years. Redundancy issues are reduced. Also, less propellant has to be toted. And that impacts the overall scale of the Prometheus-class space vehicle. The key now is having a space nuclear reactor design for the first Prometheus mission that, in fact, is a design that can be utilized for a second mission. JPL's Casani said that a shorter-duration Prometheus mission, done in the 2014 time frame, is a lot easier to do. Not only are reactor requirements reduced, but so too is the wear and tear on the craft's electric engines. Telecommunication demands are also lessened. Last year, an early list of possible Prometheus demonstration missions included treks to the Moon or Mars, perhaps multiple asteroids, even a visit to cloud-veiled Venus. A final study result for a first-time "out of the shoot" Prometheus demonstration is expected shortly. "The one that's most attractive, at least to me...is go to the Moon. It is close and you get there soon. But it remains to be seen if that survives the analysis of alternatives," Casani said. Such a lunar polar orbiting mission, he said, could fit well into the human return to the Moon activities now being scripted by NASA. "Let's say that everything is still working after three years. You spiral out of the Moon's orbit on an extended mission. If everything is working...go on to an asteroid," Casani speculated. Casani said another set of Prometheus alternative missions is longer-range. Going back to Titan, as follow-up to Europe's recent landing success there with the Huygens probe, is reasonable to consider. Neptune's Triton might also be a target. A scouting mission to Saturn's rings, jumping from asteroid to asteroid, or comet chasing - all these ventures could be, quite literally, empowered by the Prometheus program, Casani said. Soon facing Prometheus and use of nuclear fission reactors in space is preparing what's termed a Programmatic Environmental Impact Statement, or PEIS. Later this month, NASA plans to hold two public scoping meetings - one in Cocoa, Florida, the other in Washington, D.C. -- to provide information on the Prometheus PEIS and to solicit public comments. Also to be considered is the outlook that Prometheus may need new facilities such as a land-based prototype reactor to test the reactor design before actual use. Launch site support facilities for final assembly and testing of the spacecraft before launch would also likely be a must. "It is everybody's responsibility on this project to have safety as their highest priority...designing in the safety into the architecture and manufacturing for safety," said Northrop Grumman's Nelson. A report released in February by the General Accountability Office (GAO) noted that Prometheus 1 will surely undergo budgetary conniptions over the years. The project will compete for funds with other space missions, such as returning the space shuttle to flight and tidying up the International Space Station program. In their report, GAO pointed to a 2004 study by the Congressional Budget Office that pegged the JIMO cost estimate at around $10 billion. The GAO report, NASA's Space Vision: Business Case for Prometheus 1 Needed to Ensure Requirements Match Available Resources, emphasized the need for "a sound business case" for the effort. To do so, a project must have well-defined requirements, realistic cost estimates, as well as mature technology. "However, in the past NASA has had difficulties developing the realistic requirements and cost estimates needed to develop a sound business case," the GAO report explained. Historically, therefore, some NASA projects have cost more, taken longer, and achieved less than originally planned, the report cautioned. "We all recognized from the beginning that this is expensive," explained JPL's Casani. "This is a major investment in the capability. Unless there's more than a single application for it, you can't justify it. It can only be justified on the basis of opening up a new spectrum of opportunities," he concluded.